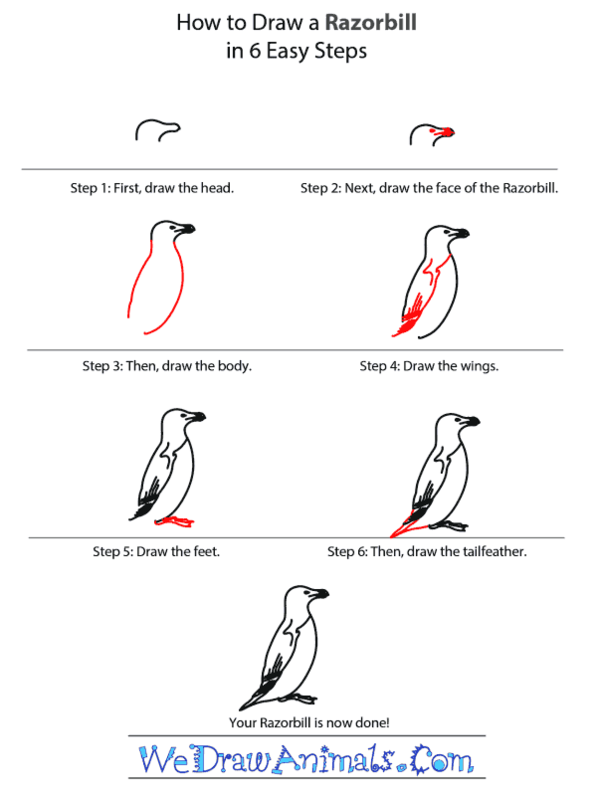 In this quick tutorial you'll learn how to draw a Razorbill in 6 easy steps - great for kids and novice artists. 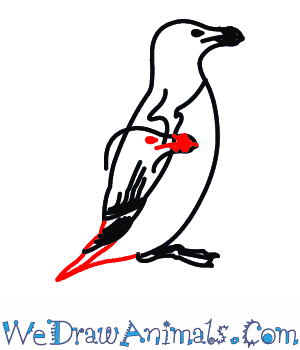 At the bottom you can read some interesting facts about the Razorbill. 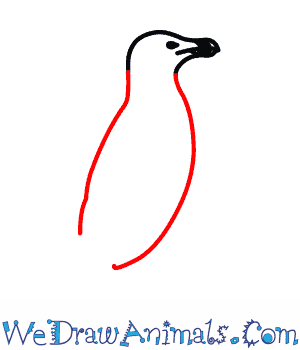 Step 1: The first step in drawing the razorbill is to draw the head and beak. 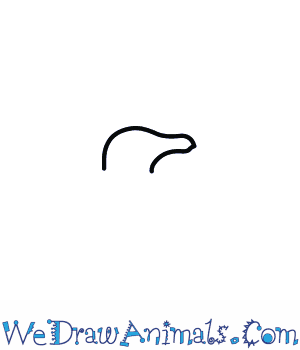 Step 2: Next, draw the face and eye. The eye is an oval right behind the mouth line with a colored beak. Step 3: Then, draw the body. The body is tall and thin with a round belly. Step 4: The next step is to draw the wings. The lines start under the chin and goes done the left side of the body. Don’t forget to add the feather detail. Step 5: Next, draw the feet. 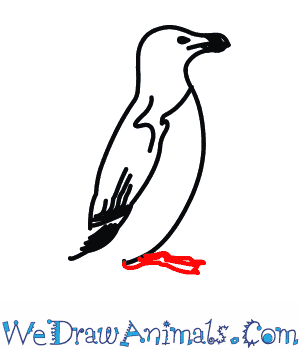 The razorbill is a water bird so they have webbed feet. 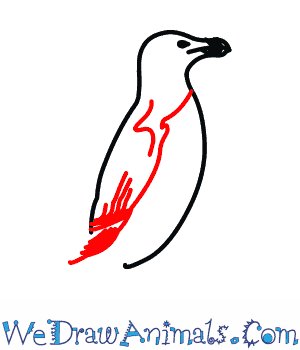 Step 6: The last step is to draw the tail feathers. The feathers are short and square. 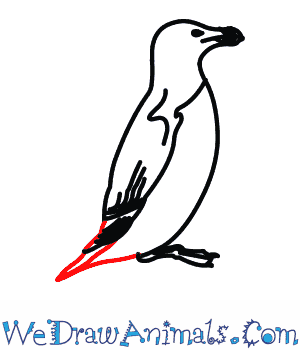 Medium-sized waterbirds Razorbill’s are gull-like birds with black heads, backs and feet with white underbellies. They have large bills with blunt ends perfectly suited to catching fish on the open ocean. They are commonly seen in huge nesting colonies in seaward facing cliffs. Spending almost all of their lives at sea, they have an average life span of 13 years. The longest recorded lifespan of a Razorbill is a bird tagged in 1967 who lived for 41 years. Razorbills have female-enforced monogamous relationships, with pair mating for life. The only time that Razorbills come in to land is to breed at massive colonies. Mated pair court each other several times during breeding season to strengthen their bonds. Less than a 1,000,000 breeding pairs of Razorbills exist in the world making them the rarest auks in the world. Lesson plan note: ?Razorbill’s form massive colonies that can be hard to imagine without seeing one. 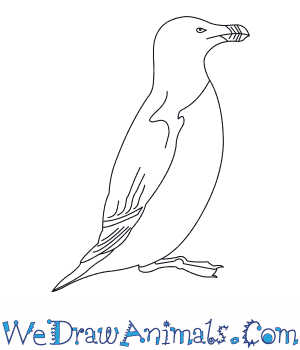 Print up paper cut outs for every student in the class, then have them color and cut out their own Razorbill. After that have students put their Razorbill into their own cubby hole to recreate a breeding colony.